Mammothfest – On The Stampede – Burning Fist! Image • June 30, 2014 • Burning Fist! With one of the heaviest, head-crushing, gut-ripping line-ups already announced for Mammothfest’s return to Brighton for 2014, we turn our attention to the series of awesome live metal treats that the festival’s organisers are putting on in the run up to August 30th and 31st. This is set to continue with a set of dates in Bristol, Eastbourne, Dartford and Worthing lined up – full details below – all of which are looking like being packed to the rafters. The shows also include a include a partnership with friends UK Tech Fest, who are working with Mammothfest to bring No Consequence, Felix Martin, Drewsif Stalin’s Musical Endeavours, DispersE, Friend For A Foe, Aeolist, Core of iO, Stone Circle and Valis Ablaze to an epic all day event at Mammothfest’s venue, The Green Door Store, on Sunday 6th July. The stampede continues to build, and will take the wreckage even further on a set of 4 sponsored UK tours featuring 4 of Mammothfest’s bands. The aforementioned Core of iO head out, as do epic progressive death outfit Stone Circle. Taken by the tide are soon to roll out across the UK while the final tour sees Exist Immortal and Cambion join forces to spread the gospel according to MAMMOTHFEST. 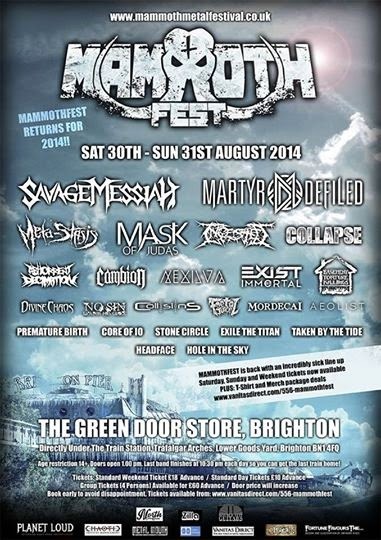 Posted in Metal NewsTagged 2014, Brighton, Festival, Live, Mammothfest, metalBookmark the permalink.